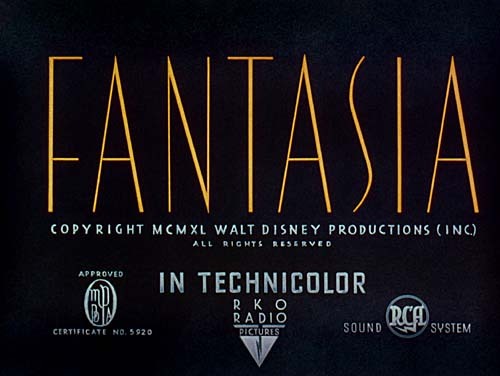 I’ve just emailed off my review of the Blu-ray release of Disney’s 1940 classic, Fantasia, for publication in Australian HI-FI. But so much to write about and only 400 words available. I didn’t even get to mention the censorship. In the Pastoral Symphony sequence the movie originally had a black centaurette kneeling before a white one, manicuring and grooming her. By 1969 this was judged to be pretty distasteful, so the film was edited to eliminate the manicurist (named Sunflower). 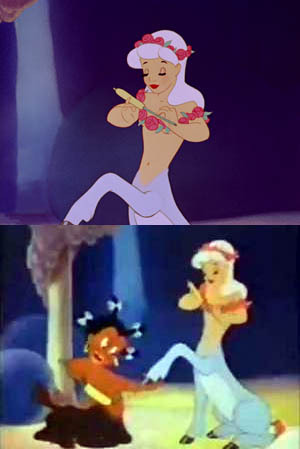 To the right are roughly matching frames, top from the Blu-ray, bottom from the pre-1969 version. As you can see, the edit was done simply by zooming up to the top, right. The bottom one is the best I could find on the web. By ‘best’ I mean ‘only’. I obtained it from this interesting post. I have retrospectively asked permission to use the shot (I rebalanced the colour to make it match the new version a little better). About 66 minutes into the Blu-ray presentation the narrator Deems Taylor announces that they’re breaking for an interval, following which — uniquely in my experience — the movie’s copyright panel is displayed for a few seconds! For a moment I thought things had come to a premature end, but no, a few more seconds and the orchestra returned and the program resumed. Very strange. Also strange, it mentions RKO Radio Pictures, at whose behest the picture was mutilated (since restored) for 1941 distribution. Note that the RCA Sound Sytem was mono. This entry was posted in Blu-ray, Cinema. Bookmark the permalink. Thank you for the clarification for the Ethnic issue on the old movie.